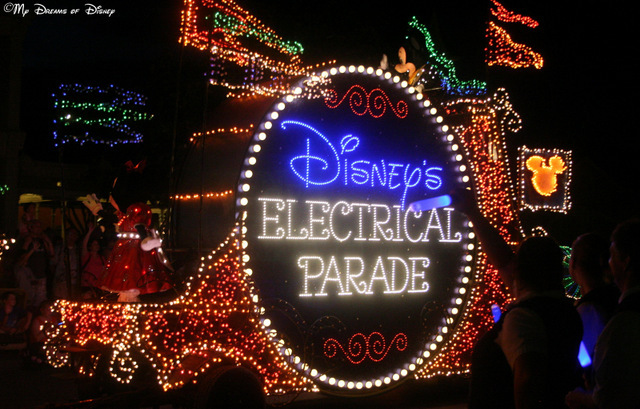 For us, our Disney Side all starts with Mickey & Minnie Mouse! I think you can see that my DisneySide has blossomed into what some would call an obsession! 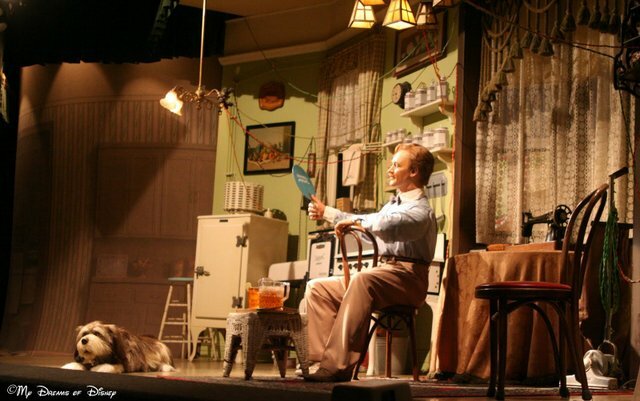 As for me, though, I think it is just a true love for all that Walt Disney brought to this world that we live in, and the legacy that he left in 1966. 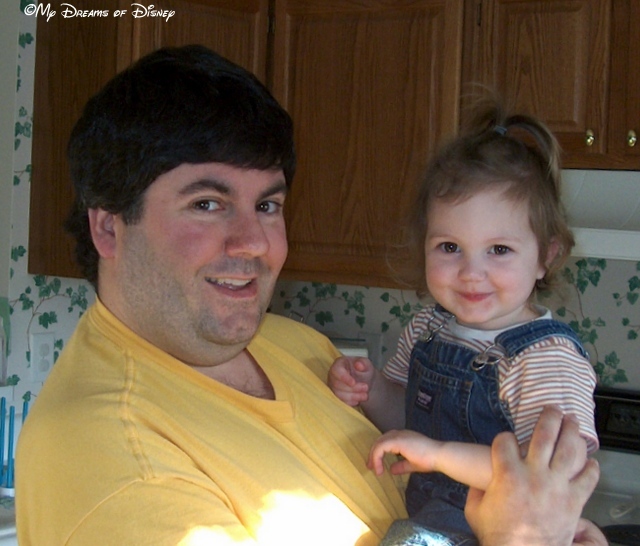 In a nutshell, I guess my DisneySide is my attempt to keep the ideals that Walt Disney lived his life by in my life, and to instill that love of life and the simple things into the life of my family so that they can continue to pass it along. Thank you for stopping by, and remember to make every day a Disney Day! 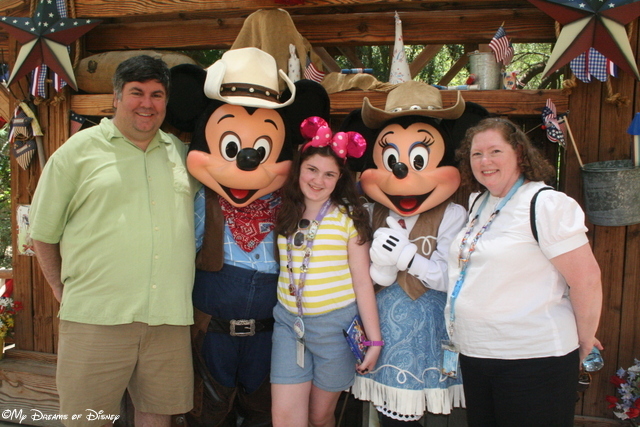 Rather than rehash that post, though, I’m going to expand on that closing paragraph, and share in photos what my DisneySide is truly all about. I hope you enjoy these photos and can feel the Disney Magic that went into these shots as much as I enjoy sharing them with you. Tell me, what does your DisneySide entail? 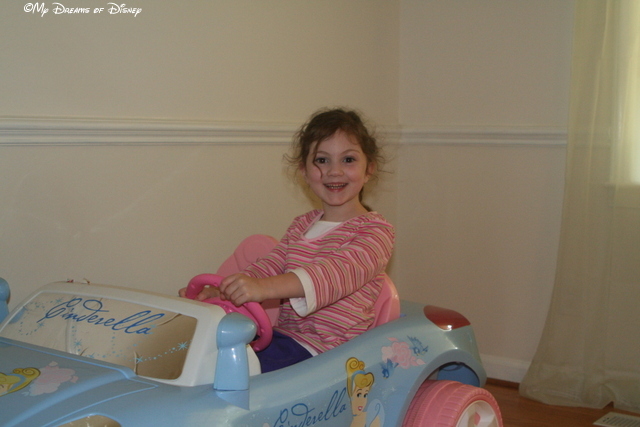 Our daughter Sophie is the true embodiment of our Disney Side. 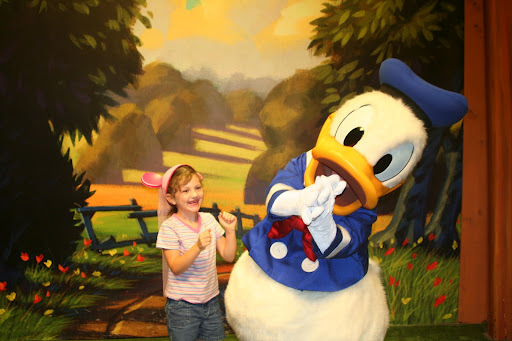 Here she is dancing with Donald Duck! 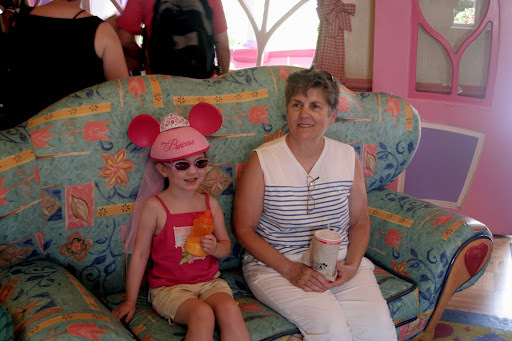 Sophie enjoying the day with her Meemaw and sitting on Minnie’s Couch! 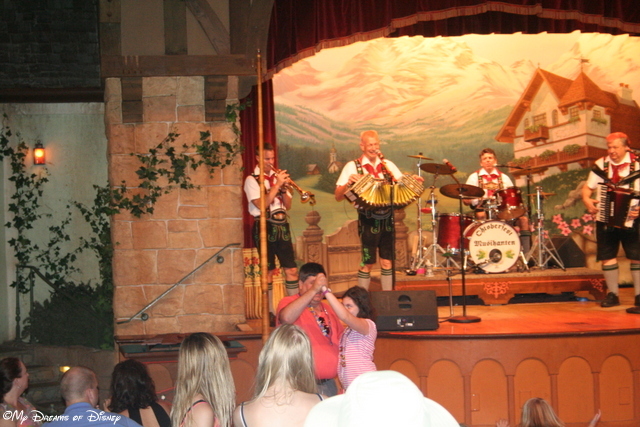 My Disney Side shined when Sophie and I danced at Biergarten! 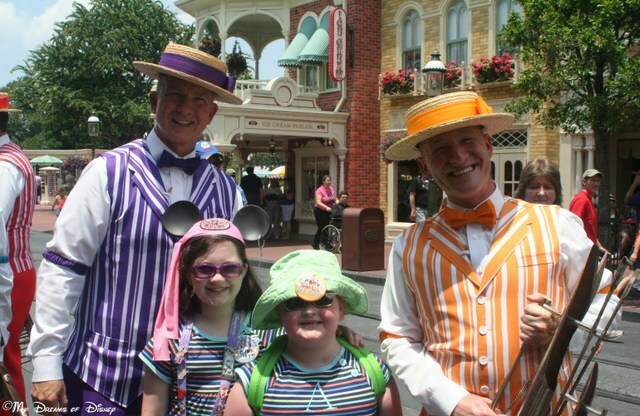 Sophie and her Disney Side shine through and through with this picture of two of the Dapper Dans and her cousin Anna Jane! 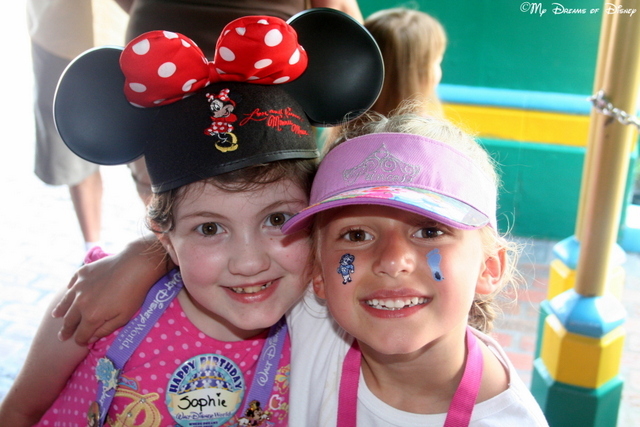 Our DisneySide was in full force on June 19, 2008, the day that Sophie and her BFF got to spend the day together at the Magic Kingdom! 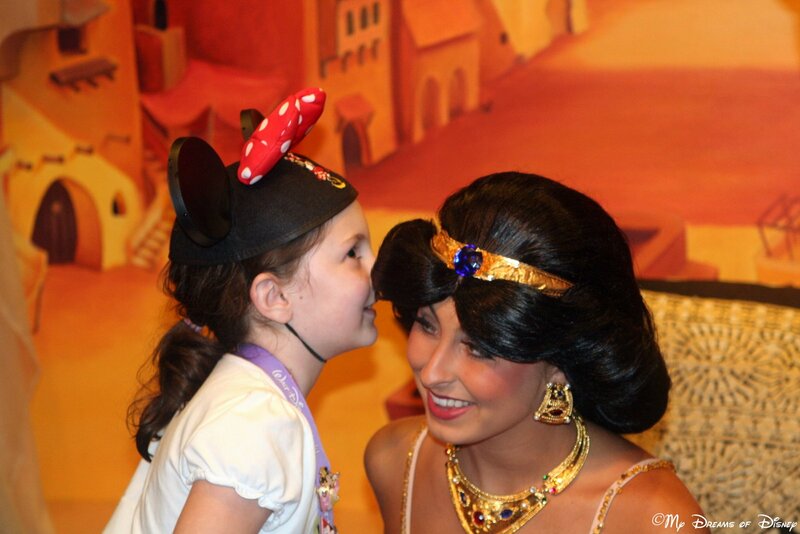 Lastly, Sophie’s DisneySide was in full force when she spoke with Princess Jasmine. Here she is telling her a secret about a certain costume she wanted to buy! Thank you for stopping by today! Please click on the button below to head over to Focused on the Magic so that you can check out the rest of the entries, and thank you to my friend Deb for hosting this great series! Tell me, how do you show your DisneySide? The Good Life…three simple words that can mean so much. What do you think of when you hear people talking about The Good Life? Of course, in the context of the picture above, the natural tendency is to think of Disney related things that, added up, comprise the good life. Of course, this is not always the case. I thought in this post we would take a look at some of the layers to the onion that I am that make the life I’m living The Good Life. I hope you enjoy, and will take the time to comment and let me know what your ideas are for the good life! Thanks for stopping by! 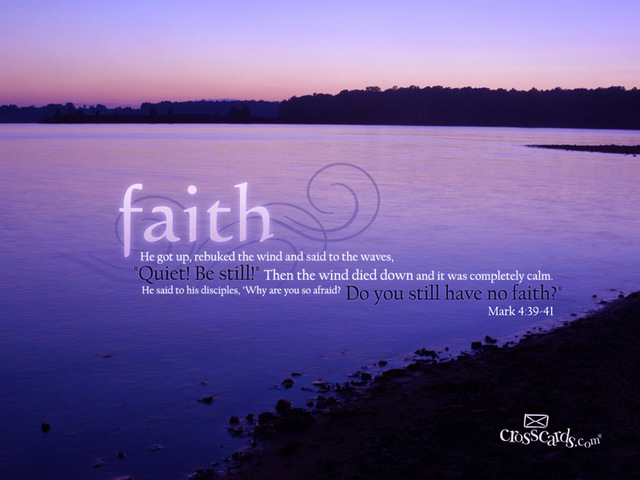 is knowing that you have Faith in your Lord and knowing He is there for you. The Good Life…something that we always attain for, something that we always strive for…and something, despite the trials and tribulations that sometimes befall me or my family, that I am very blessed to have in my life. Thank you for stopping by and seeing what The Good Life means to me. What does The Good Life mean to you? Please let me know in the comments, and thanks! 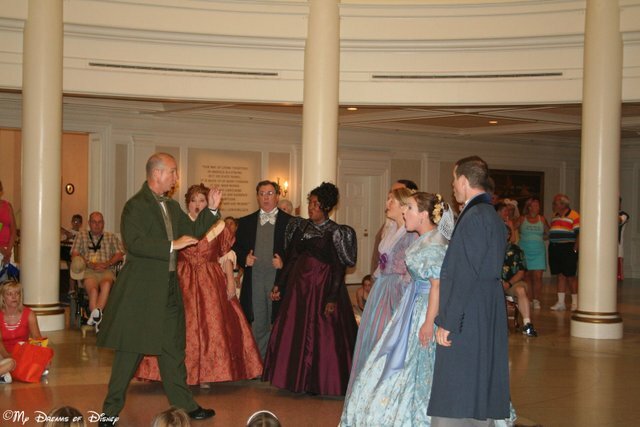 No matter the day, no matter the occasion, the Voices of Liberty will lift your spirits with Patriotic Music! 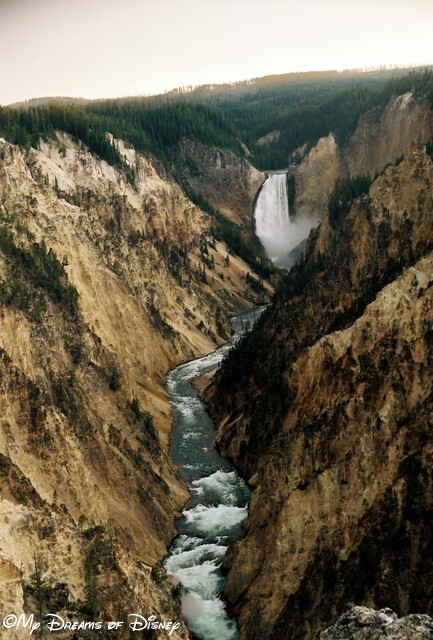 Hello my friends, and welcome to a very special Wordless Wednesday post. This week we are taking time out to Remember 9/11, and while I can talk about where I was during 9/11, I’m not going to, as I put a lot of emotion in my thoughts for our Prayers for the Week post this past Sunday. If you missed that post, please go back and check it out — it is very special to me. 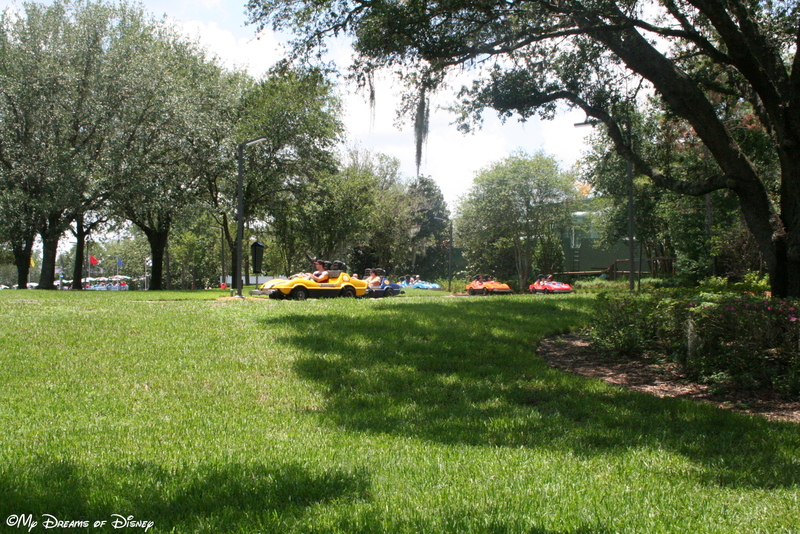 However, this is Wordless Wednesday, and as a result, I’ve got some pictures from various Walt Disney World settings that I would love to share with you! Special thanks, as always, to one of my best friends, Deb from Focused on the Magic, who is great at bringing us all together for our posts each week! 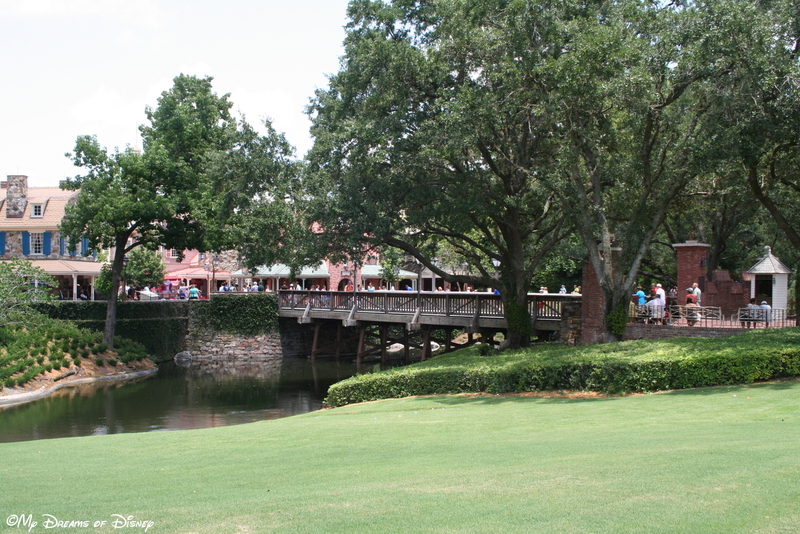 A few simple pictures from our last trip to Walt Disney World that I’m sharing for the Wordless Wednesday Blog Hop. 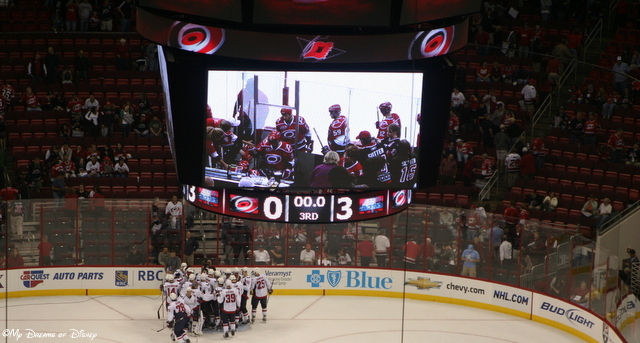 While that was not in April, I think any of these pictures can serve as a great calendar shot for April. 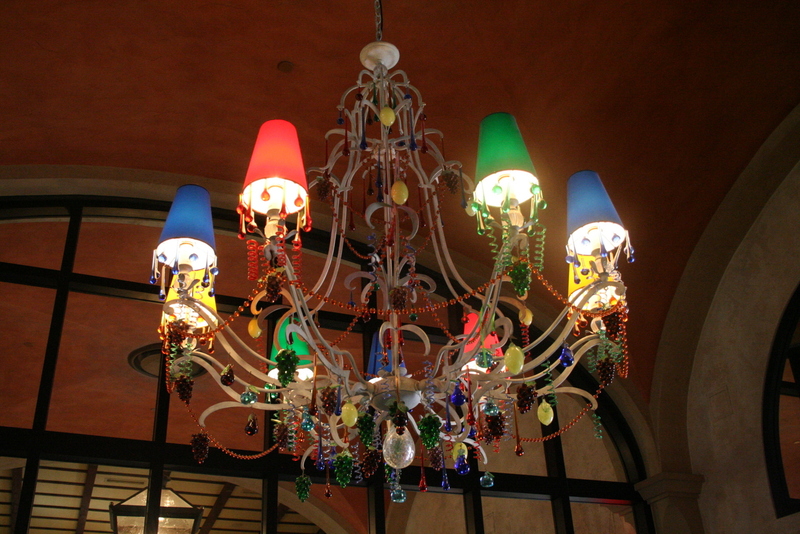 The Via Napoli Chandelier is so colorful! 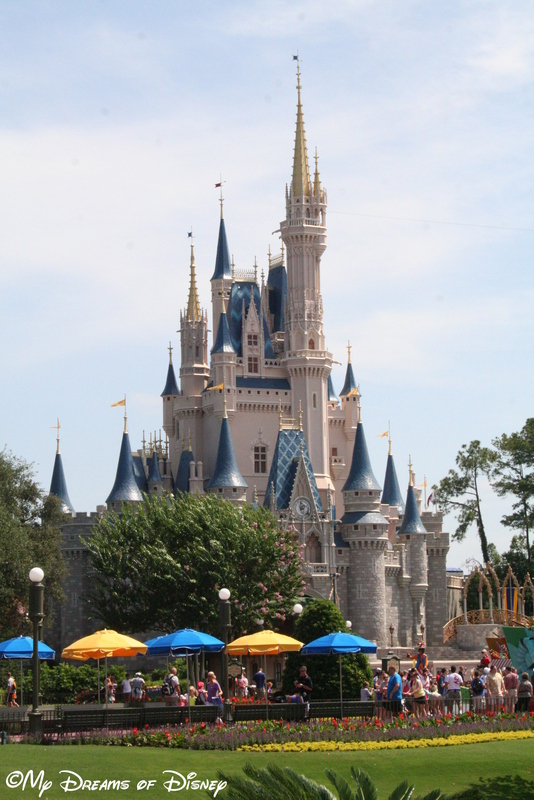 The perfect shot any time of the year — Cinderella Castle! 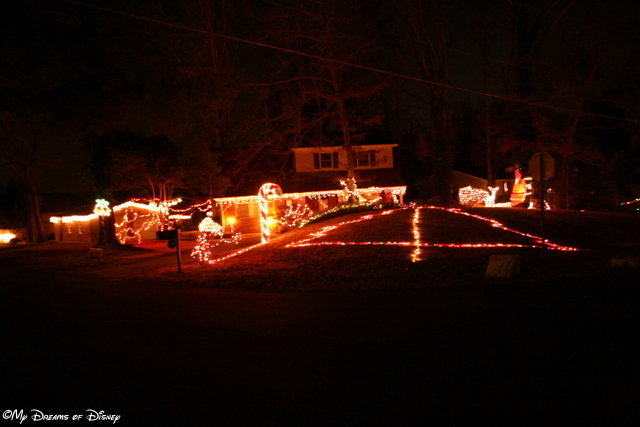 Thank you for stopping by as we share some of our photos with you! Special thanks, as always, to Deb from Focused on the Magic for hosting, now please go check out the rest of the entries for this week! Just click on the button below! Hello everyone, and welcome back to this week’s Friendship Friday post! Each week I’m spending a little time sharing some thoughts on those people in my life that are special to me. Last week we talked about my wonderful wife Cindy, and this week, well this week we’re going to talk about our lovely daughter Sophie! 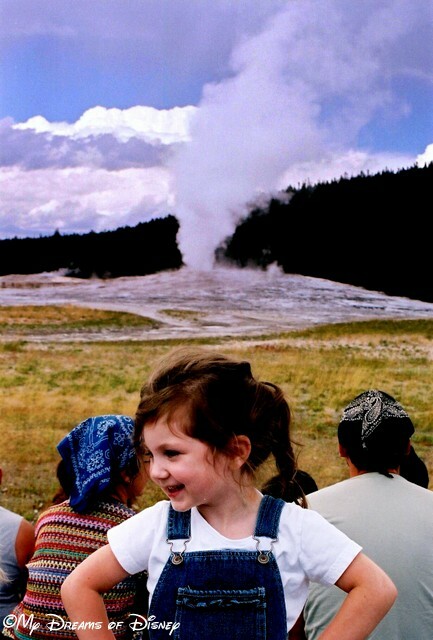 Sophie was a wee little lass when she was born, weighing in at just 4 pounds, 2 ounces, and at only 17 1/2″ long. 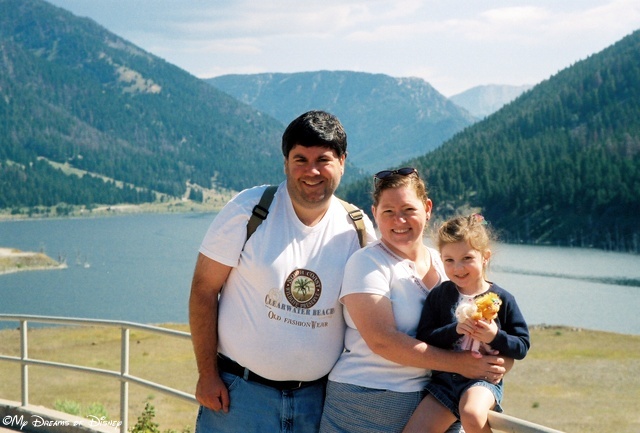 She was born 7 weeks early, not because she wanted to be born early, but because Cindy got very, very sick with a rare form of Pre-Eclampsia called Help Syndrome. 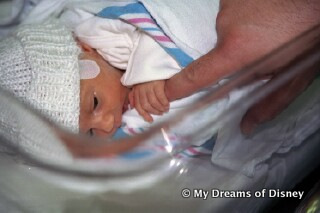 In the picture above, you see Sophie grasping my finger at the tender age of 2 (days, not years) as I was visiting her in the NICU. Sophie ended up spending just two weeks in there, which to us was quite remarkable because we saw some young ones that had already been in for three and four weeks when Sophie was born. 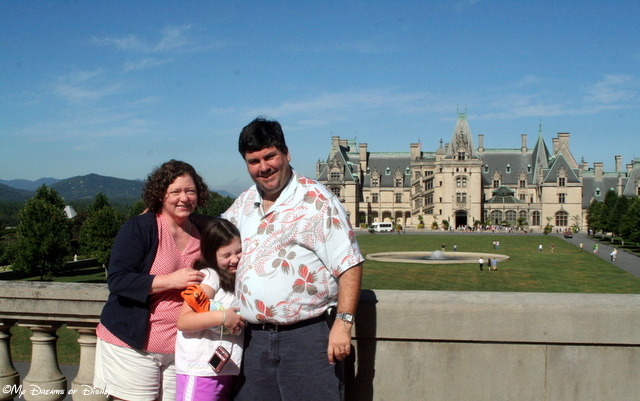 Sophie is now 11, and has grown up to be a typical 6th grader, and just like her dad, is a big fan of Walt Disney World! In fact, she might even be a bigger fan of Disney then I am! 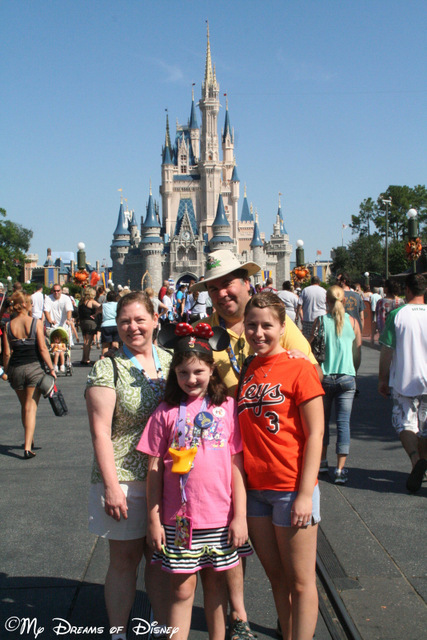 My first trip to Walt Disney World was when I was 11 — Sophie just made her 9th trip to Disney World! She isn’t perfect, but she isn’t supposed to be, either. She has her own set of problems, starting with the fact that she has organization issues, doesn’t do the work that she is supposed to do when it’s supposed to be done, and can be maddeningly stubborn, just like me. But she does have wonderful gifts, and it’s those gifts that I choose to look at more then her shortcomings. She is incredibly sympathetic to those in need; she is funny, witty, and loves Jesus; and she loves her Mommy and Daddy, even though it seems like there are times when she goes out of her way to get in trouble. In the end, I guess what you should know about Sophie is that she has a loving, gentle heart, and a kind soul. She is a person that, should you be fortunate to meet her and be her friend, you would not regret that decision. Most of all, though, Sophie is our little girl, our baby, our pride and joy, and the love of our lives. 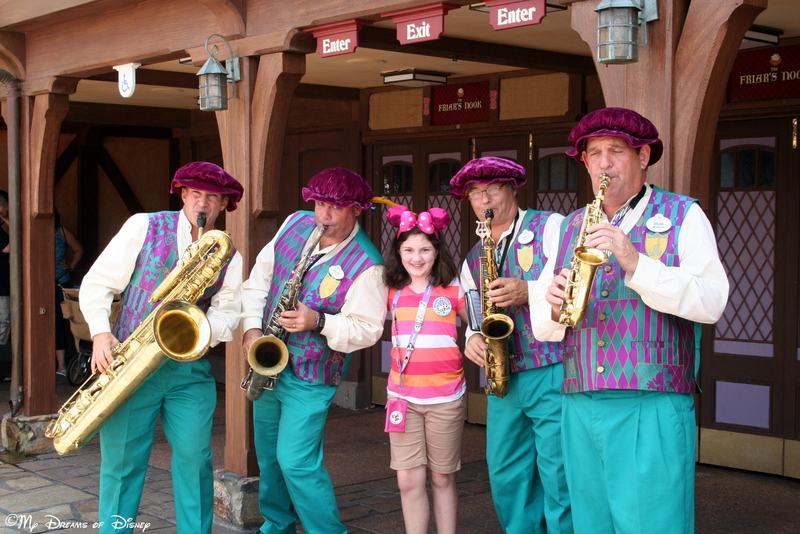 Sophie surrounded by members of The Dapper Dans! I can’t take credit for this idea — it belongs squarely with my good friend Heidi from Heidi’s Head! She started this, and I ran with it also, so go check out her Friendship Friday posts also by clicking on the button below! Thanks for stopping by! Friendship Friday: Meet my Sister-in-Christ Brenda!